Had a fall from a ladder at work? There are lots of people that will make use of a ladder at some point during their working life. Some people will use them on a daily basis to carry out large parts of their work, such as electricians and decorators for example. Others may use a ladder once in a while to reach items kept on high shelving. No matter how frequent the use may be, working at height for any amount of time carries the risk of potential injury. Having an accident while using a ladder at work can result in a wide range of different injuries, many of which can have a major impact on your life. Head injuries are common, particularly when a person falls backwards. Broken bones are also a common occurrence when people fall from ladders. If you feel your accident was caused by the negligence of your employer, you may be able to hold them responsible and claim compensation for your injuries and any financial losses you have sustained. We would be happy to discuss the particulars of your case during a free consultation, where one of our experienced solicitors can evaluate whether you have a valid claim. If you are entitled to claim compensation for your accident, our injury solicitors will be able to take your case on a no win, no fee basis. The benefit of this service is that it removes the financial risk of making a claim. If we cannot win your claim for compensation, you will not pay us a penny. Ladders are a major cause of accidents and injuries in the UK. It is estimated that over 50,000 people visit hospitals each year due to accidents involving a ladder. Can I claim compensation for a ladder accident? was the accident caused by negligence on the part of your employer? did you sustain a personal injury as a result of this accident? If you can answer yes to each of the above 3 questions, you should in most cases be eligible to claim financial compensation for the pain, suffering and losses caused. There are numerous regulations which are in place to ensure the safety of workers who work at height or are required to make use of ladders to carry out their tasks. According to these rules, it is essential that workers who use ladders are adequately trained and are provided with suitable personal protective equipment. Employers are legally obliged to offer a safe working environment to their staff, which means ensuring that adequate and appropriate training has been provided, as well as risks assessments being carried out for all settings. If your employer has failed in this duty of care and it has resulted in you being injured, you may be eligible to make a no win no fee work accident claim. Whether the symptoms of your injury are mild or severe, we can assist you with your claim. To discuss your case further and to receive answers to any relevant questions you may have, please feel free to request a call back using the contact form above. The Health and Safety Executive have produced a guidance leaflet on the safe use of ladders and stepladders in the workplace. This leaflet further explains the responsibilities placed on employers, including the requirement to inspect equipment before use and guidance on how and when to use them safely. There is no single answer to this question, as the amount of compensation that is awarded to you will depend on your personal circumstances. The amount awarded for a successful claim will be judged partly on the type and severity of the symptoms that you suffer, and partly on the extent of any financial losses incurred as a result of your accident. Once the severity of your condition and the level of liability has been established, the solicitor will seek to achieve the highest compensation award possible for you. You can encourage this through supporting your solicitor in obtaining as much evidence and documentation as possible to strengthen your case, such as keeping receipts for any expenses for example. We pride ourselves on providing clients with a friendly, professional and empathetic service. We understand that the decision to make a personal injury claim against an employer is a difficult one to make, so we will take the time to ensure that you are fully aware of your legal rights and have knowledge of the claims process from the outset. A no win, no fee service to ensure that you are not financially at a loss through making a claim. If we cannot win your claim, you won’t pay us a penny. We welcome the opportunity to discuss your individual case and requirements during a free case assessment. 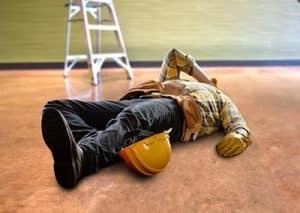 During this call, we will ask you a few questions about your ladder accident, such as when it happened, how it happened and what injuries you sustained as a result. We will then let you know if you have a valid claim, at which point it is up to you if you decide to proceed or not. This service is provided with no obligation or pressure, so you are always in control. We assure our clients that we will reach a conclusion on their case as quickly as we possibly can without having an adverse effect on the amount of compensation that is awarded to them. Furthermore, we take care to ensure that clients are kept updated throughout their case by provided regular progress updates.